In Semantic Web languages, such as RDF and OWL, a property is a binary relation: it is used to link two individuals or an individual and a value. However, in some cases, the natural and convenient way to represent certain concepts is to use relations to link an individual to more than just one individual or value. These relations are called n-ary relations. For example, we may want to represent properties of a relation, such as our certainty about it, severity or strength of a relation, relevance of a relation, and so on. Another example is representing relations among multiple individuals, such as a buyer, a seller, and an object that was bought when describing a purchase of a book. This document presents ontology patterns for representing n-ary relations in RDF and OWL and discusses what users must consider when choosing these patterns. This document is a Working Group Note, produced by the Semantic Web Best Practices and Deployment Working Group, part of the W3C Semantic Web Activity. This document is one of a set of documents providing an introduction and overview of ontology design patterns produced by the SWBPD Working Group's Ontology Engineering and Patterns Task Force. As of the publication of this Working Group Note the SWBPD Working Group has completed work on this document. Changes from the previous Working Draft are summarized in an appendix. Comments on this document may be sent to public-swbp-wg@w3.org, a mailing list with a public archive. Further discussion on this material may also be sent to the Semantic Web Interest Group mailing list, semantic-web@w3.org, also with a public archive. In Semantic Web languages, such as RDF and OWL, a property is a binary relation: instances of properties link two individuals. Often we refer to the second individual as the "value" or to both both individuals as "arguments" [See note on vocabulary]. Issue 1: If property instances can link only two individuals, how do we deal with cases where we need to describe the instances of relations, such as its certainty, strength, etc? 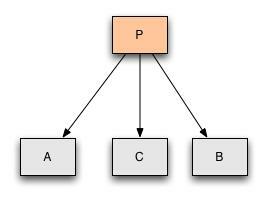 Issue 3: If instances of properties can link only two individuals, how do we represent relations in which one of the participants is an ordered list of individuals rather than a single individual? The solutions to the first two problems are closely linked; the third problem is fundamentally different, although it can be adapted to meet issue one in special cases. Note that we don't use RDF reification in these patterns; the reasons for this decision are discussed in the final section. :book1  dc:title  "Defining N-ary Relations on the Semantic Web" . Christine has breast tumor with high probability. There is a binary relation between the person Christine and diagnosis Breast_Tumor_Christine and there is a qualitative probability value describing this relation (high). Steve has temperature, which is high, but falling. The individual Steve has two values for two different aspects of a has_temperature relation: its magnitude is high and its trend is falling. John buys a "Lenny the Lion" book from books.example.com for $15 as a birthday gift. There is a relation, in which individual John, entity books.example.com and the book Lenny_the_Lion participate. This relation has other components as well such as the purpose (birthday_gift) and the amount ($15). United Airlines flight 3177 visits the following airports: LAX, DFW, and JFK. There is a relation between the individual flight and the three cities that it visits, LAX, DFW, JFK. Note that the order of the airports is important and indicates the order in which the flight visits these airports. Another way to think about the use cases is how they might occur in the evolution of an ontology. We discover that a relation that we thought was binary, really needs a further argument - a common origin of use case 1. The nature of the relation is such that one or more of the arguments is fundamentally a sequence rather than a single individual - use case 4. As we describer earlier, in Semantic Web Languages, properties are binary relations. Each instance of a property links an individual to another individual or a value as shown below. One common solution to this problem (pattern 1) is to represent the relation as a class rather than a property. Individual instances of such classes correspond to instances of the relation. Additional properties provide binary links to each argument of the relation. We can model examples 1, 2, and 3 above using this pattern. For instance, in the example 1 the instance of a new class Diagnosis_Relation would represent the fact that Christine has been diagnosed with a breast tumor with high probability. Similarly, in the example 3 the instance of a class Purchase would represent the fact that John bought the book "Lenny the Lion" from books.com for $15. The second solution (pattern 2) is to represent several individuals participating in the relation as a collection or an ordered list. We use this solution when the order of the arguments of the n-ary relation is important in the model, as in the example 4 above. The task force plans to produce a suggested vocabulary for describing that a class represents an n-ary relation and for defining mappings between n-ary relations in RDF and OWL and other languages. A note on this vocabulary is forthcoming. We present a pattern where we create a new class and n new properties to represent an n-ary relation. An instance of the relation linking the n individuals is then an instance of this class. We consider three use cases for this pattern, illustrated by examples 1-3 above. Ontologically the classes created in this way are often called "reified relations". 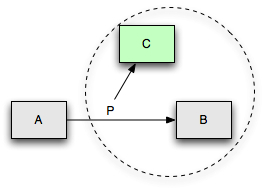 Reified relations play important roles in many ontologies3 (e.g. Ontoclean/DOLCE, Sowa, GALEN). However, the RDF and Topic Map communities have each used the word "reify" to mean other things (see the note below). Therefore, to avoid confusion, we do not use the term "reification" in this document. The individual _:Diagnosis_Relation_1 here represents a single object encapsulating both the diagnosis (Breast_Tumor_Christine, a specific instance of Disease) and the probability of the diagnosis (HIGH)3. It contains all the information held in the original 3 arguments: who is being diagnosed, what the diagnosis is, and what the probability is. 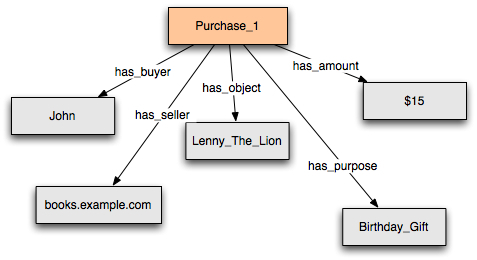 We use blank nodes in RDF to represent instances of a relation. The additional labels on the links indicate the OWL restrictions on the properties. We define both diagnosis_value and diagnosis_probability as functional properties, thus requiring that each instance of Diagnosis_Relation has exactly one value for Disease and one value for Probability. In RDFS, which does not have the OWL restrictions or functional properties, the links represent rdfs:range constraints on the properties. For example, the class Diagnosis_Relation is the range of the property has_diagnosis. Note that in discussing this pattern, we are not making any suggestion on the best way to represent probability pf an event. We simply use it as an example here. 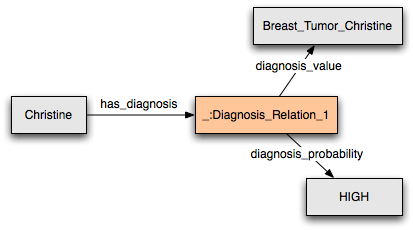 We have a different use case in the example 2 above (Steve has temperature, which is high, but falling): In the example with the diagnosis, many will view the relationship we were representing as in a fact still a binary relation between the individual Christine and the diagnosis Breast_Tumor_Christine that has a probability associated with it. The relation in this example is between the individual Steve and the object representing different aspects of the temperature he has. In most intended interpretations, this instance of a relation cannot be viewed as an instance of a binary relation with additional attributes attached to it. Rather, it is a relation instance relating the individual Steve and the complex object representing different facts about his temperature. Such cases often come about in the course of evolution of an ontology when we realize that two relations need to be collapsed. For example, initially, we might have had two properties—has_temperature_level and has_temperature_trend—both relating to people. We might then have realized that these properties really are inextricably intertwined because we need to talk about "temperatures that are elevated but falling." The RDFS and OWL patterns that implement this intuition are however the same as in the previous example. A class Person (of which the individual Steve is an instance) has a property has_temperature which has as a range the relation class Temperature_Observation. 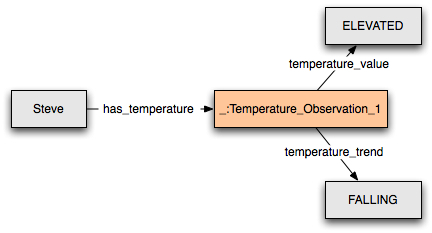 Instances of the class Temperature_Observation (such as _:Temperature_Observation_1 in the figure) in turn have properties for temperature_value and temperature_trend. The following diagram shows the corresponding classes and properties. For the sake of the example, we specify that each purchase has exactly one buyer (a Person), exactly one seller (a Company), exactly one amount and at least one object (an Object). The diagram refers to OWL restrictions. In RDFS the arrows can be treated as rdfs:range links. Note that representation of OWL restrictions themselves follows this pattern: an OWL restriction is essentially a ternary relation between a class, a property, and a restriction value. In this case, an instance of the Restriction class is similar to the instance of Purchase. In our example, we did not give meaningful names to instances of properties or to the classes used to represent instances of n-ary relations, but merely label them _:Temperature_Observation_1, Purchase_1, etc. In most cases, these individuals do not stand on their own but merely function as auxiliaries to group together other objects. Hence a distinguishing name serves no purpose. Note that a similar approach is taken when reifying statements in RDF. Creating a class to represent an n-ary relation limits the use of many OWL constructs and creates a maintenance problem. The problem arises when we want to have local range or cardinality restrictions on some role in the n-ary relation that depend on the class of some other role. For example, we might want to say that we buy only instances of a class Book from companies in the category Bookseller (cf. use case 3). Expressing this constraint requires a special subclass of the n-ary relation class that represents the combination of restrictions. For instance, we will have to create a class Book_Purchase with the corresponding range restrictions for the property seller (allValuesFrom Bookseller) and object (allValuesFrom Book). We end up having to build an explicit lattice of classes to represent all the possible combinations. Note that the value of the inverse property is_buyer_for for the individual John, for example, is the individual Purchase_1 rather than the object or recipient of the purchase. Some n-ary relations do not naturally fall into either of the use cases above, but are more similar to a list or sequence of arguments. The example 4 above (United Airlines flight 3177 visits the following airports: LAX, DFW, and JFK) falls into this category. In this example, the relation holds between the flight and the airports it visits, in the order of the arrival of the aircraft at each airport in turn. This relation might hold between many different numbers of arguments, and there is no natural way to break it up into a set of distinct properties relating the flight to each airport. At the same time, the order of the arguments is highly meaningful. In cases where all but one participant in a relation do not have a specific role and essentially form an ordered list, it is natural to connect these arguments into a sequence according to some relation, and to relate the one participant to this sequence (or the first element of the sequence). We represent the example below using an ordering relation (nextSegment) between instances of the FlightSegment class. Each flight segment has a property for the destination of that segment. Note that we add a special subclass of flight segment, FinalFlightSegment, with a maximum cardinality of 0 on the nextSegment property, to indicate the end of the sequence. RDF supplies a vocabulary for lists — the collection vocabulary, which can also be used in cases where a group of arguments to the relation have no special role. We do not use the RDF collection vocabulary in this example, because it is less practical to use a generic ordering relation when we are representing something more specific. In this example, we represent a temporal order among constituents. It may be natural to think of RDF reification when representing n-ary relations. We do not want to use the RDF reification vocabulary to represent n-ary relations in general for the following reasons. The RDF reification vocabulary is designed to talk about statements—individuals that are instances of rdf:Statement. A statement is a object, predicate, subject triple and reification in RDF is used to put additional information about this triple. This information may include the source of the information in the triple, for example. In n-ary relations, however, additional arguments in the relation do not usually characterize the statement but rather provide additional information about the relation instance itself. Thus, it is more natural to talk about instances of a diagnosis relation or a purchase rather than about a statement. In the use cases that we discussed in the note, the intent is to talk about instances of a relation, not about statements about such instances. However, formally, we interpret properties as representing relations, i.e. sets of ordered pairs of individuals. Each instance of a relation is just one of those ordered pairs. The "Property" in each triple is fundamentally different from the individuals in the triple. It merely indicates to which relation the ordered pair consisting of the two individuals belongs. We normally name individuals; we do not normally name the ordered pairs. Often in cases such as use case 1, we wish to regard two instances of the relation that have the same argument as equivalent. We can capture this intuition by using RDF blank nodes (e.g., _:Diagnosis_relation) to represent relation instances. In use case 2, we wish to consider the possibility that there might be two distinct purchases with identical arguments. In that case, the node should be named, e.g. Purchase_1. "Reified relations" play an important role or have a special status in a number of ontologies, e.g. see Sowa, J. Knowledge Representation. Morgan Kaufmann, 1999; Welty, C. and Guarino, N. Supporting ontological analysis of taxonomic relationships. Data and Knowledge Engineering, 39 (1). 51-74. There are other ways to represent partitions of values. Please refer to a note on Representing Specified Values in OWL [Specified Values]. In RDF Schema version, we represent them simply as strings, also for simplicity reasons. 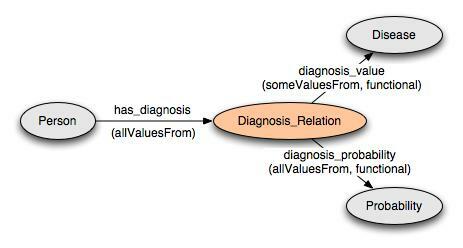 RDF has a property rdf:value that is appropriate in examples such as the Diagnosis example here. While rdf:value has no meaning on its own, the RDF specification encourages its use as a vocabulary element to identify the "main" component of a structured value of a property. Therefore, in our example, we made diagnosis_value a subproperty of rdf:value property instead of making it a direct instance of rdf:Property to indicate that diagnosis_value is indeed the "main" component of a diagnosis. Note that we used a named individual for an instance of the class Purchase (Purchase_1) rather than an anonymous blank node here. In this example, there might be two distinct purchases with exactly the same arguments. Representing Specified Values in OWL: "value partitions" and "value sets" , Alan Rector, Editor, W3C Working Draft, 3 August 2004, http://www.w3.org/TR/swbp-specified-values/ . OWL Web Ontology Language Overview , Deborah L. McGuinness and Frank van Harmelen, Editors, W3C Recommendation, 10 February 2004, http://www.w3.org/TR/2004/REC-owl-features-20040210/ . Latest version available at http://www.w3.org/TR/owl-features/ . OWL Web Ontology Language Semantics and Abstract Syntax , Peter F. Patel-Schneider, Patrick Hayes, and Ian Horrocks, Editors, W3C Recommendation, 10 February 2004, http://www.w3.org/TR/2004/REC-owl-semantics-20040210/ . Latest version available at http://www.w3.org/TR/owl-semantics/ . RDF Semantics , Pat Hayes, Editor, W3C Recommendation, 10 February 2004, http://www.w3.org/TR/2004/REC-rdf-mt-20040210/ . Latest version available at http://www.w3.org/TR/rdf-mt/ . "Turtle - Terse RDF Triple Language, Dave Beckett. Merged patterns 1 and 2 into one pattern with different use cases. The same use cases remain, but they are described as different use cases for the same pattern. Removed consideration bullet talking about logical equivalence of patterns 1 and 2 (since they are a single pattern now). Changed the wording under "Representation Pattern"
Changed some of references to "relation" to "relation instance" or "instance of relation"
The editors would like to thank the following Working Group members for their contributions to this document: Pat Hayes, Jeremy Carroll, Chris Welty, Michael Uschold, Bernard Vatant. Frank Manola, Ivan Herman, Jamie Lawrence have also contributed to the document. This document is a product of the Ontology Engineering and Patterns Task Force of the Semantic Web Best Practices and Deployment Working Group.